Inadequate sun exposure and vitamin D deficiency have put people at risk of serious illnesses including cardiovascular diseases, tuberculosis, cancer and diabetes, according to an expert. "Vitamin D deficiency is an epidemic of such magnitude that it is not only alarmingly widespread, but also a root cause of many serious diseases," said Dr Afrozul Haq, Senior Clinical Scientist, Pathology and Laboratory Medicine Institute at the Shaikh Khalifa Medical City (SKMC). These include rickets (childhood bone disease), psoriasis, osteoporosis, cancer, heart disease, diabetes, tuberculosis, respiratory infections, allergy, autoimmune diseases, neurological disorders such as multiple sclerosis and Alzheimer's disease, as well as, common cold and flu. In the Middle East region, despite the year round sunshine, statistics are grim. At the first International Conference on Vitamin D Deficiency in studies, which showed that a high percentage of children are vitamin D deficient -- 90 per cent of students in Abu Dhabi. Eighty-one per cent of post menopausal women in the Middle East tested for osteoporosis also have inadequate vitamin D levels. In the UAE, 90 per cent of the population were vitamin D deficient when first tested (2009) while 82 per cent of infants were found to be lacking of vitamin D supplement (2006). Dr Haq, who is also the Chairman of the Conference's Scientific Committee, attributed these high prevalence rates to the very hot climate which discourages outdoor activities, the wearing of abaya and burqa, lack of regulations for vitamin D fortification of food and drinks and prolonged breast feeding without vitamin D supplementation. to protect oneself from the dire effects of vitamin D deficiency, Dr Haq advised between 10 and 20 minute sun exposure of not less than 40 per cent of body surface, from 10am to 2pm, twice a week. "Ninety per cent of vitamin D comes from the sun, which is the main source of vitamin D3." 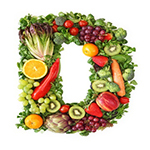 Vitamin D supplement can also come from dietary sources such as fish (salmon, mackerel, tuna, sardines) or fish livers (cod liver oil), milk and dairy products, egg yolks, and beef liver. To avoid serious illnesses, Dr Haq suggested fortifying oneself with vitamin D, to the level of "115 nanomoles (nMol) per litre. Maintain this level," he advised.